Researchers have long explored the desirability and benefits of industry-university collaborations and acknowledge they can be fraught with difficulties. We examine one such alliance, focused on driverless cars, a current hot topic in the public imagination and in technology design. Our collaboration began as an alliance between two anthropologists, one a professor at the University of North Texas, the other a consultant with the Nissan Research Center in Sunnyvale, California. We designed a research project for a design anthropology course that Christina Wasson taught in Fall 2014. Brigitte Jordan, at the time, was conducting an informal ethnography class for engineers and computer scientists at NRC. 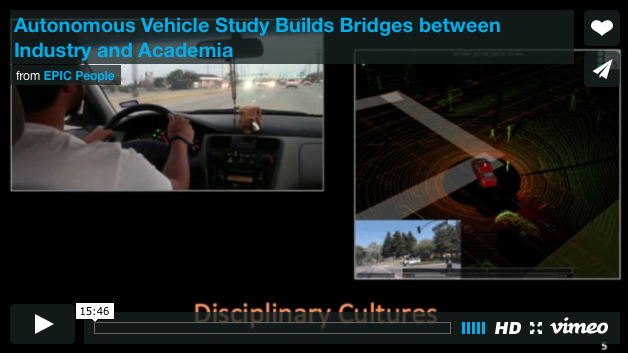 Our alliance had two objectives: to determine what a successful industry-university collaboration could look like when it involves ethnographic research in the high-tech sector, and to provide insights into usable ethnographic methods and data that would support social and cultural questions in autonomous vehicle (AV) research at the Nissan center. We found these two geographically separated classes eventually allowed building bridges across academia and industry, anthropology and engineering, leading in the long run to some softening of the boundaries between the two disciplines. Here we discuss significant variance in the research cultures of class participants at UNT and NRC (ethnographers and automotive engineers), and the various manners in which these differences were bridged over the course of the project (or not, as the case may be). We explore factors which inhibit or encourage exchange between university and industry micro-cultures, consider reasons for the success or failure of such projects, and offer suggestions for improving future collaborations. We end with ideas about what a model for productive industry-academia collaboration could look like.